Bud: I came across a site online dedicated to the legend of Chuck Norris. One of the facts listed there says that Chuck Norris is the only person alive who doesn’t sleep, he waits. 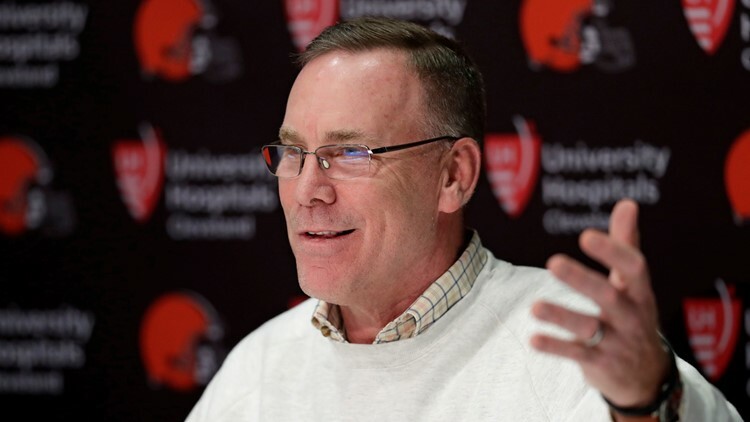 Does John Dorsey know he’s being disrespected this way? — Joe W.
That site also says, “Chuck Norris always knows the EXACT location of Carmen SanDiego.” Look, Dorsey is not driven by ego. He’s content, for instance, to know she has a son who projects as a value pick in the fourth round. Bud: At our Palm Sunday church service, Baker and OBJ cutouts (with attached palms) strolled down the aisle in the entrance procession before mass. — Jim Walsh, Olmsted Falls. You sure you saw this before the mass started and not after you drained the chalice of communion wine? Bud: I see that poor Baker Mayfield is trying to make a few more bucks endorsing Allen Edmonds shoes. I guess the Brew Garden and Sky Zone didn’t make the cut. — Vince G., Cincinnati. The Allen Edmonds pitch is that “men like Baker only wear the best shoes because they know that what you wear tells the story of who you are.” I feel the need to add a caveat for You Said It contributors: jelly sandals and a bathrobe doesn’t make you the Big Lebowski. Bud: Did you see the Marine from Tallmadge crawl across the finish line at the Boston Marathon to honor his fallen comrades? Isn’t that a little more inspiring than Tiger Woods winning for the 81st time in his career? — Tim, C-Town. It gets my vote. But I realize I speak as someone whose idea of endurance training is making it all the way to the curb to get the mail. Bud: We heard you briefly talk about your round of golf at Augusta. Can we expect to watch you as a 'Super Senior' anytime soon? — O. Bill Stone. I’m confident even at my age I could hold my own with college golfers, as long as the tee box is no farther than 20 yards from the clown’s mouth. Bud: Since “The Q” is now “The Rock,” does J.R. need a call from the governor to get out? — Scott P.
I forgot JR was still with the Cavs. Then again, if we go by that last series with the Warriors, there’s a chance he forgot, too. Bud: The Cavs can’t pick any lower than sixth in the NBA draft. Whew. That would seem to rule out any chance of a colossal mistake. — Anthony Bennett. The only thing that would make Cavs fans feel better than hearing this from you, Anthony, is getting advice from Andrew Bynum on making good first impressions in the work place. Bud: This time around, will LeBron let Ty Lue have a whistle at practice? — Jim Corrigan, Fairview Park. You Said It “winners” operate on their own frequency.